V. How To Prevent Blemishes? JIt is obvious that almost everybody experiences blemishes once in the lifetime. Blemishes are probably a nightmare to sufferers, as they cause uneven patches of color on the skin, reducing self-confident and making people afraid to interact with others. 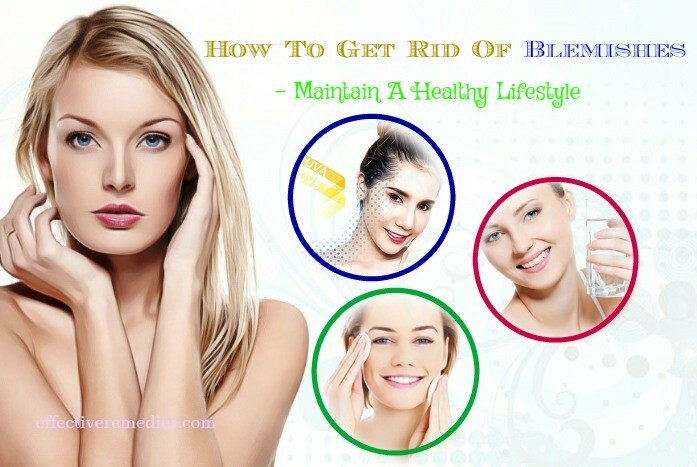 Whether you are having blemishes or just curious about them, you all can find useful information in this article. 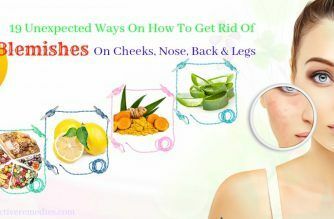 Today, Effective Remedies will bring you everything you need to expand your understanding of blemishes, and also 19 amazing ways on how to get rid of blemishes on cheeks, nose, back & legs quickly. In a simple term, blemishes are dark spots or discoloration of the skin. Blemishes come in a variety of forms. We can mention signs that have appeared since birth like birthmarks, brown and port-wine stains, or other agents like freckles, melasma, sun spots, liver spots, etc. Because there are many types of blemishes, the size of them is also very diverse. They are often small dots, but in certain cases, they are pretty big and may even become larger over time and spread all over the skin surface. Blemishes do not deny access to any part of the body. They are most commonly associated with the face, shoulders, and back. Blemishes occur mainly due to the excessive dead skin cells and oil production, leading to pore blockage. As we all know, the skin needs a sufficient amount of oil for nourishment and moisturizing. However, when the skin excretes too much oil, dead skin cells cannot shed, they will accumulate and clog the pores. This condition also contributes to bacteria development and acne formation. Inflamed acne leaves bruises and scars after healing, which will turn into blemishes later. UV rays: Expose to UV rays in a long period will trigger sunspots and melasma, both are pigment variations. Moreover, these harmful rays can make your freckles worse by darkening them. Makeup products: Many people have a habit of using cosmetics to conceal skin flaws without being aware that they will seal pores, ending up with more blemishes. Aging: When people start entering middle age, many skin and health problems come and evolve, age spots – a branch of blemishes – are one of those. Age spots include three major types: liver spots (flat and brown spots), purpura (red-brown spots), and Seborrheic Keratosis (black or brown spots). Skin diseases: Some diseases spoil the appearance of the skin, as they release skin tags, rash, deep marks or scars.  For example, rosacea, herpes, chickenpox, measles all lead to blemishes. 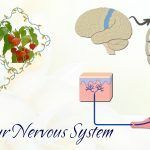 Hormones: Hormonal imbalance or significant change in hormone level inside the body can increase the secretion of sebum. 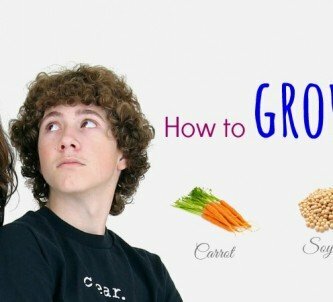 During puberty, hormone level alters, sebaceous glands (which are responsible for secreting oil) are overactive and create more oil. That is why teenagers and adolescents are more likely to get acne than others. Air pollution: Surrounding air is no lack of detrimental substances for human’s skin health. They undoubtedly damage the skin and form blemishes. At this moment, surely you have achieved fundamental knowledge about blemishes. So let’s move on to top 16 ways to get rid of these annoying things that we gathered here. We hope you can sort out the most convenient and suitable methods to extrude blemishes and bring your skin back to health. Live a healthy life is a key for a healthy body . Skin issues in general and blemishes in particular will gradually fade away if you build up a reasonable daily routine. Drink plenty of water: Water is an indispensable part of life. Every skin and health problem, including blemishes, can get better when you provide enough water for the body. You should drink 2 liters of water per day to keep your body fully hydrated. Pay attention to skincare: Keeping your skin as clean as possible is of paramount importance to improve skin conditions. Wash your face and shower every day to remove impurities and enable your skin to breath. Also remember to scrub and exfoliate 2 to 3 times a week to peel all dead skin cells, after that, apply any kind of moisturizer to prevent dryness. Choose the right cosmetics: If you have to use cosmetics, make sure to pick items with skin-friendly and non-comedogenic components, while staying away from products containing lanolin or isopropyl myristate as they will block your pores. Protect the skin from direct sunlight: Exposure to UV rays is a cause of blemishes. To get rid of them, do not go in the sun without skin protection measures. Covering up open skin areas, bringing umbrella, using sunscreen, and staying inside during the noon are basic ways that you should keep in mind. Everything you consume turns into a part of your body, both inner and outer. Nutrients from foods that your body absorbs and metabolizes have a vital influence on your health and skin . “What you eat is what you are. The healthier the foods are, the better your skin will look.” Therefore, it is necessary for you to follow a healthy diet in order to keep a flawless fair skin. Lemon is rich in vitamin C, which plays an important role in collagen synthesis and elastin formation, making your skin stronger and full of vitality . It also acts as a natural bleach that blurs scars, lightens blemishes and elevates skin tone. For blemishes on small skin surfaces, you need to extract lemon juice and apply to the affected areas, wait for about 10 minutes, and rinse off with cool water. For blemishes on back, legs or blemishes covering large areas, you should cut a lemon in half and rub on the skin before taking a shower to gain best effects. Note: If you have sensitive skin, you should dilute lemon juice with the same amount of water to minimize irritations. Perhaps there are no ingredients that women enjoy more than aloe vera in the field of beauty. Due to a ton of content vitamins, minerals as well as antioxidant properties, aloe vera helps cure blemishes, heal damaged skin cells and rejuvenate the skin . Peel an aloe vera leaf and take the gel out. Apply aloe vera gel to the skin with blemishes and massage for some minutes. Leave it on for 15 minutes more, then wash off with water. Repeat this once or twice a day. Turmeric provides powerful antioxidant and antiseptic abilities as it has a chemical element called curcumin . 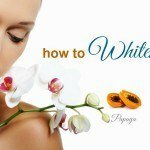 This allows turmeric to whiten skin and eliminate blemishes. Mix half a teaspoon of turmeric powder, one tablespoon of honey with one teaspoon of lemon juice. Next, apply this mixture to the affected areas and let it sit for 10 minutes. Rinse with warm water first and then cool water. Mix 2 teaspoons of turmeric powder, two teaspoons of sandalwood powder with half a cup of green bean powder. Slowly add water to form a paste, then add a few drops of almond oil if you want. Apply the paste to your skin for 5 to 10 minutes. 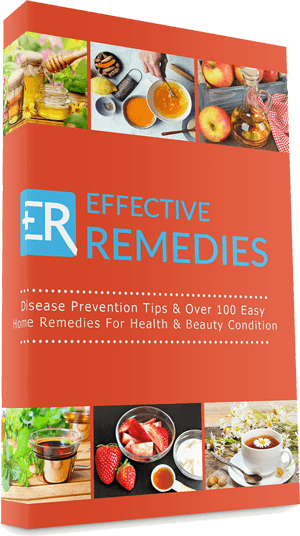 In this remedy, sandalwood works as a mild astringent and an anti-aging agent. It helps fade spots, even out the pigment and comfort the skin. About green bean powder, research shows that it is much better than vitamin C and vitamin E in treating blemishes when it has detoxifying quality, together with the ability to soothe irritation and supply moisture to the skin. The combination of turmeric, sandalwood and green bean power will speed up the healing process and satisfy you with healthy skin. Cucumber is an amicable method for many skin issues on account of its cooling capacity. It also does not give any side effect that you do not worry about when using it for your blemishes treatment every day. Cut a cucumber into tiny cubes and mash. Add oatmeal, yogurt or lemon juice to the mashed cucumber, mix well. Apply the mixture on the affected skin and let it sit for 30 minutes. Do this daily and maintain within a week. Thanks to antioxidants abilities, along with a host of vitamins and nutrients, using tomato is one of the most effective ways to banish blemishes. 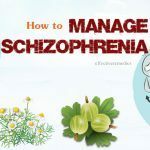 The remedy is very simple: You can choose either grind a tomato for its meat or extract tomato juice and apply to your skin, wait for 20-30 minutes, then wash off with water. Repeat the process several times a week. 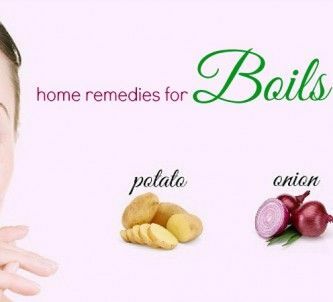 Garlic has antibiotic, antioxidant, antibacterial and anti-inflammatory properties, all of which help to get rid of bruises, scars, blemishes and to brighten the skin. Chop some cloves of garlic and extract the juice. Apply to your skin and leave for a couple of minutes. Thoroughly rinse off with water to eliminate the distinctive smell. Baking soda is an exfoliator that sheds off dead skin cells, thus lightens blemishes. It is also capable of neutralizing pH level of the skin, which prevents sebum to produce too much. Mix 1 teaspoon baking soda with some drops of olive oil. Apply the mixture to the influenced areas and scrub it in slow motions. Let it on for about 5 to 10 minutes, then cleanse with water. Enzymes in papaya will enhance skin exfoliation, which helps diminish blemishes and acne-causing blemishes. 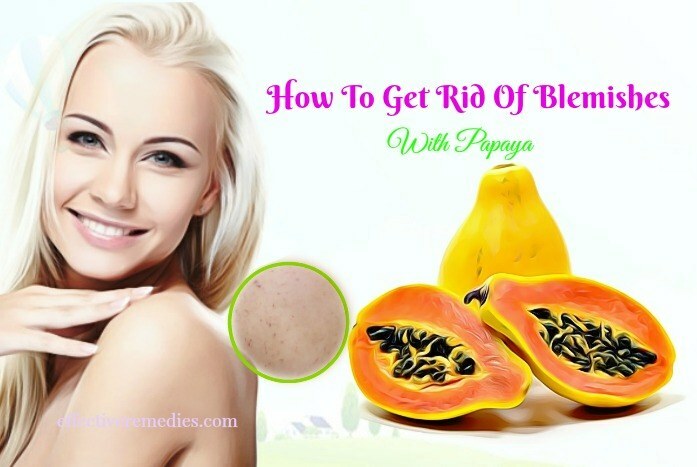 Papaya can also control oil level of your skin. Crush some pieces of papaya to pulp. Add to the pulp milk, honey, and wheat flour. This step is optional. Apply the papaya pulp or the mixture to your skin every night before going to bed for 15-20 minutes. Yogurt is a house of vitamin A, B, K, lactic acid, and probiotics that lighten dark spots and profoundly purify the skin. It additionally peels dead skin cells and accelerates the regeneration of the skin. These are reasons why yogurt is a standout among the best remedies for treating blemishes. You can combine yogurt with many ingredients, in this remedy, we recommend you turmeric. Add a pinch of turmeric powder to 2 tablespoons of plain yogurt. Cover the affected skin with the mixture for 20 minutes, then rinse off with cool water. Repeat this twice to thrice a week. Oatmeal contains some antioxidants. Its soothing and cleansing properties unite with the acidity of lemon make this method beneficial for reaching the blemish-free skin. Mix 2 tablespoons of oatmeal, one tablespoon of lemon juice with enough water (or rosewater) to form a paste. Massage your skin for 2 to 3 minutes, and then leave it on for 10 minutes. Use this method twice a week. Honey has antioxidants that help expel scars and repair damaged skin cells. Its emollient and humectant abilities will ease and soften the skin, make it smooth and glossy. What you need to do is to daily apply raw honey to your blemishes for about 15 minutes, then wash with water. Egg white contains sulfur compounds and characteristics of enzymes that uneven skin tone, lighten blemishes and tighten skin pores. Use a whip to beat an egg white. Apply it to your skin and let it stay for 10 minutes. Mix 1 or 2 drops tea tree oil with a few drops of olive oil. Apply the mixture to your blemishes. Leave it on there overnight or as long as possible. Both tea tree oil and olive oil have antiseptic, antioxidant and anti-inflammatory properties that evacuate existing blemishes and prevent the arrangement of new ones. Mixing tea tree oil with olive oil is the best approach to avoid skin burns causing by undiluted tea tree oil. Massage the affected skin with a moderate quantity of jojoba oil. Do every night before bedtime. You can replace jojoba oil with castor oil for similar effects. Jojoba oil is well-known in resolving sebum and moisturizing the skin because it can easily penetrate inside by opening clogged pores. It is likewise high in antioxidants, which help improve scars and blemishes condition. Combine 1 to 2 drops of lavender oil with some drops of any carrier oil having antioxidants. Apply the mixture to your skin and then massage in circles for a few seconds. Let it dry for about 2 hours, then rinse off. Repeat this 2 or 3 times a day. 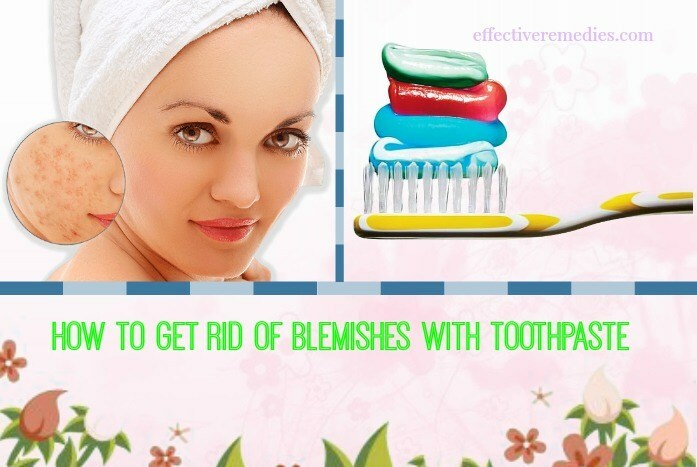 You might be surprised when seeing the word “toothpaste”, but it is an awesome ingredient for blemishes treatment. Toothpaste can imbue abundance oil on the skin and deplete breakouts. 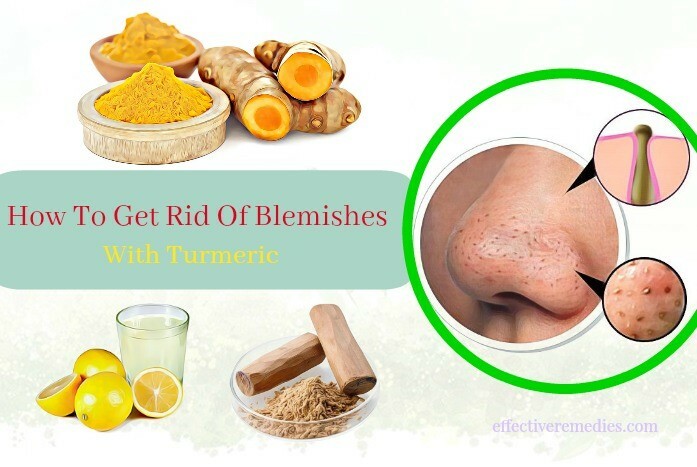 It also reduces the presence of blemishes if its composition contains green tea, turmeric or peppermint. Apply a little toothpaste on your blemishes and rinse off after 10 minutes, you will get the outcome in a brief span. In the event that you are having microbial imbalance inside the body, especially in your gut, the risk of skin aggravation is higher, which prompts the existence of inflammation and imperfections. Since probiotics help decrease the number of awful microscopic organisms and increase that of valuable microbes, scientists believe they will positively affect skin health. Supplement probiotics by adding to your daily diet foods such as yogurt, kefir, sauerkraut, dark chocolate, and miso soup. Broccoli, cauliflower, and cabbage belong to the family of plants known as cruciferous vegetables, which are all rich in antioxidants, vitamins, and minerals. These substances lend you a hand in fighting against harmful factors, supporting skin cells growth, and nourishing the skin. Legumes like peas, lentils, and any kind of beans hold numerous fibers and proteins, which help with your digestion and make your intestine free of toxins, dirt, and bad stuff, leading to a clear skin. On the off chance that you consume legumes frequently, your overall health will also turn out to be better. Omega-3 fatty acids in oily fish are viable in reducing acne and managing inflammation, from that give assistance to heal blemishes. You can find a source of omega-3 in salmon, sardines, mackerel, and black cod. We are talking about foods that break down rapidly after digesting, which set off a sharp increment in insulin level and raise blood glucose index. 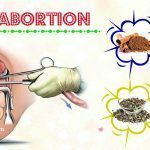 They also cause hormonal inconstancy, leading to imperfections development. Instead of eating white bread, white rice, processed foods, chips or confectionery, intake more brown bread and rice, whole grains, fruits, sweet potatoes, and other veggies. Like high-glycemic foods, dairy stores in the body can spike insulin and increase blood sugar level, which encourages the discharge of sebum. Dairy also contains growth hormones that promote skin cells to multiply, copious skin cells will little by little block pores. As a result, your skin will be loaded with blemishes. Most saturated fats originate from animal sources like red meat and butter. The greatest drawback of saturated fats is to uplift LDL level, which can put you in heart diseases and stroke danger. On the side of skin health, these fats exasperate your skin and bring an outburst of acne. Create a skincare routine and be more careful if you have sensitive or oily skin. Cleanse, tone, and moisturize each morning and evening with delicate products so that not to irritate your skin. Use alpha-hydroxyl acids (AHAs) to exfoliate no more than two times during the week. Nevertheless, AHAs may not be appropriate to every skin type, so ask your dermatologist first. Use a make-up remover even if you do not apply makeup because it not only rinses the makeup layers but also clears oil and nourishes the skin. Do not poke, squeeze or make any impact on acne or pimples with bare hands since bacteria may pass to your skin and worsen the situation. You will face a high probability of infections and blemishes. Apply a layer of sunblock with the SPF index of at least 30 whenever going out, reapply every 3 to 4 hours to have the best effect on preventing dark spots. Perform a proper diet, alongside the utilization of detox beverages once per month within a week. Do exercise to stabilize blood circulation, detoxify, and purify the skin. In serious circumstances when you experience nodules or cysts (extreme stages of pimples), contact experts for professional treatments to ensure that blemishes only have the lowest chance to show up. 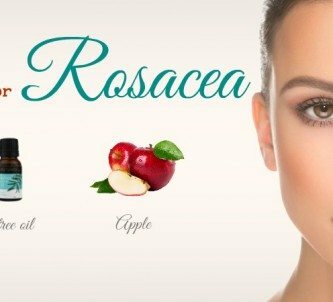 Above are 19 useful ways on how to get rid of blemishes on cheeks, nose, back & legs quickly that you must try for radiant skin. Please let us know by commenting if your blemishes disappear after following those methods. For more information, visit our main How To page.